The dead of winter is upon us. The populace is bloated from too much Champaign and foie gras (if there is such a thing). If you are an Anglophone living in the South of France, you have probably added travel to the list of things that contribute to your feeling of fatigue. It is just one more thing to wear you down after the seemingly endless barrage of multiple course meals, family and social engagements, alcohol sodden occasions, end of year work deadlines and epidemic cold and flu season. It is time to go back to work, re establish more balanced and less decadent routines. When you come back from work now, you want a simple easy to prepare meal and TV. Maybe not. Maybe you are film preferring purist. Why not? I was once one such person but alas I have been converted. It seems anyone you meet now has a favourite series. Even in France, where film snobbery abounds, the numbers are growing. That being said, I have yet to meet anyone, French or otherwise, that says that their favourite TV series is French. French film is still revered but French television shows.. non. For the moment, it seems the Anglophone universe has the decided edge in the domain of people’s preferred series. It may have to do with the sheer quantity of television shows being produced in English. Up until 10 years ago almost all TV shows were formulaic and thus highly predictable. One might watch them for a certain time, if they were experiencing a clinical depression or taking some mind numbing substances and needing to watch something reassuringly bland and predictable. That can only go on for so long before the viewer begins to feel the effects of monotony, intellectual atrophy and a pervading feeling of being insulted by the screenwriters who are being paid while shovelling the same old drivel between advertisements. Most television is still this way. The critical difference is that not only are many more TV shows being made but a far wider range and for the first time, I would argue, it is not an oxymoron to speak of “interesting TV shows”. Film’s length, according to Alfred Hitchcock, should correspond directly to the capacity of the human bladder. There is nothing innate about a form of audiovisual expression which lasts 1 hour and 40 minutes that makes it superior to another which continues over several 50 minute chapters. In the past, the difference was advertising and what writers/directors were allowed to do within the television format. No self respecting writer wanted to work on a sit-com where the central narrative and possible subjects dealt with were dictated by dog food advertisers. With the advent of streaming, downloading and the box-set, these kinds of constraints have begun to topple with many broadcasters. Former film writers, actors and directors have begun to convert to this new medium which allows them greater latitude than in films where their stories must be limited to approximately 2 hours. Now they can develop their characters and add nuances, multiplicity of perspectives, depth and sub plots that are not possible in a medium as brief as film. Enter series like ‘The Wire’, ‘Madmen’, ‘Breaking Bad’ and ‘Misfits’. In these shows there is a very complex backdrop which evolves in a way that is more evocative of real life. In ‘The Wire’, for example, the real main character is the city of Baltimore and the people living within its institutions. There are no real good guys and bad guys. 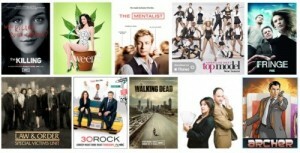 Each season focuses on a different sector. Season one deals primarily with the police and the street criminals. Season 2 the dock workers and their union. Season 3 the city hall. Season 4 schools. Season 5 journalists. The story line for season 5 was already written when the first episode came out meaning that there was a meaningful story arc being developed throughout each episode, like chapters in a novel. Indeed, one might go so far as to say that this style of series making is to films what novels are to poetry.